I have mentioned many times in my videos over the past couple of years that I make my taco meat in the slow cooker. Today, I will be showing you how I prepare my meat, why I do it this way, and how we use this meat in several different ways. I’ve told you before that I usually make one big recipe for the weekends, and we eat off of that for the entire weekend. This slow cooker taco meat is perfect for that. You can use hard shells, soft shells; you can make taco salad, or nachos. There are just so many ways to use this meat without feeling like you’re eating the same thing over and over. So if your family doesn’t usually care for leftovers, this might be a good recipe for you to try. This recipe is also very forgiving; I usually have beans cooked and ready to add in, but I forgot on this day until it was too late. So you can do it the way your family likes it. Add beans, leave out the corn, add hot peppers, leave out the rice. Tweak it to suit your family! Put ground beef in slow cooker. Add rice, corn, spices, and any optional ingredients. Serve taco meat with hard or soft shells, chips, or on salad. Top with cheese, lettuce, tomato, sour cream, hot sauce, or any other toppings you like. Obviously, you can brown your ground beef on the stove top. But frankly, I don’t have the 20 minutes or so it would take to do that, so I always use my slow cooker to brown my meat. I put the meat in, leave it for a couple hours, then I can just drain off the grease and my meat is ready to go. I leave this meat mix on “warm” in the slow cooker while we do the things we need to do, then I reheat the meat if I need to later on. I enjoy mine on a soft shell with some lettuce, cheese, and hot sauce. I hope your family enjoys this as much as we do! Be sure to comment below and tell me if you try it or any of my other recipes. I love to hear from you! Click here to watch the full Taco Meat in the Slow Cooker Vlog! 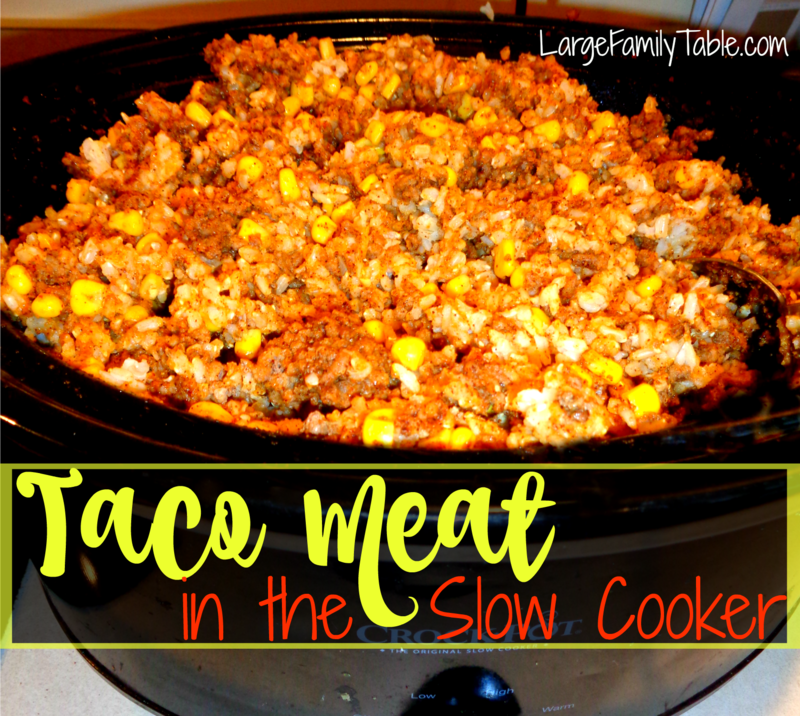 Such a great idea to cook taco meat in the slow cooker! Just wondering if you drain the corn before adding, or pour it in liquid & all? I make up a taco meat mixture like this and then roll it up in flour tortillas, place in a cake pan, top with a couple handfuls of cheese, and pour some enchilada sauce over it. We call them beefaladas and they are so, so good. Your idea of using the crockpot would work well when everyone is coming and going, eating at different times. I’ll definitely do this during our cranberry growing season when longs hours keep us outside. Could this be made and then frozen? Sure thing! You can freeze it in a baking dish (wrap with foil and saran wrap), or in a freezer bag. This looks so much better than just using meat with cheese in our tacos! A great way to spread the meat a little too. When you add refried beans, do you add just 1 can? Total game changer! Thank you for making me think outside the box! Not only does the corn and rice add to the flavor but stretches the meat – THANK YOU!! I added canned diced green chilies (mild) and salsa to the mixture too, SO GOOD! I used to use my crockpot until I got my Instapot. Now I brown it there. Pour 1 cup water over the bottom of the pot, and then place in your trivet that came with your instant pot. Place 1-2 pounds ground beef on your trivet seal the instant pot closed, with vent closed.. Set to high pressure and cook for 6 minutes.